Managing mutual funds is our core business. We specialise in the management of active equity and absolute return funds for private and institutional investors. We continuously review and develop our investment methods in line with the latest scientific findings. We offer all FIRST PRIVATE funds via private banks, cooperative banks and savings banks, in addition to several financial service providers. Our absolute return strategies aim to generate sustainable returns that are – as far as possible – independent of the market, while at the same time limiting risk. The FIRST PRIVATE multi-strategy approaches rethink the concept of diversification. We see the allocation of strategies and ideas from a wide range of asset classes as a modernisation of the traditional multi-asset approach. In our view, successful asset management must be based on investment strategies that generate returns regardless of interest rates or the market enviroment. The overall aim is to make your portfolio more robust. First Private Wealth is an active and broadly diversified multi-strategy fund. The multi-strategy approach aims to achieve compelling returns across various market phases and reduce the dependency on bonds. Unlike conventional balanced funds, First Private Wealth invests not only in equities and bonds, but also in alternative assets such as currencies and commodities as well as market-independent alpha strategies. To this end, the fund management follows a systematic investment approach to identify promising asset classes and securities using a combination of quantitative models and fundamental research. The portfolio is hedged against sharp fluctuations on an ongoing basis. This fund takes advantage of carefully selected opportunities in tandem with hedging against market turbulence. As a result, it offers compelling return prospects while limiting risk. * Fund publications are also available at www.fundinfo.com. ** since 01.12.2009; previously 1,25% p.a. Our equity strategies are designed with the aim of achieving sustainable added value versus standard benchmark indices and passive investment approaches that is as independent of the market environment as possible. The FIRST PRIVATE equity processes are based on the systematic, bottom-up selection of the most attractive individual stocks. Our approach predominantly draws on the quantitative and systematic evaluation of fundamental (balance sheet) ratios. Our portfolios focus on broad diversification, consistently limiting the proportion accounted for by individual shares. The key prerequisite for investment success is the disciplined implementation of the investment processes outlined. The overall aim is to make your portfolio more robust. 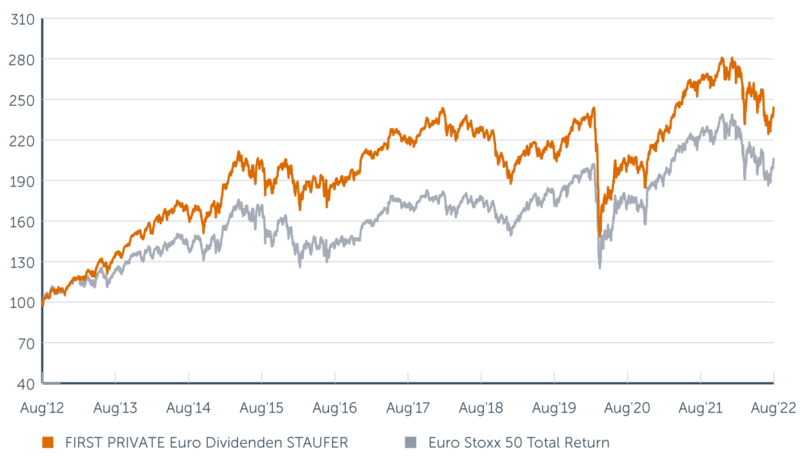 First Private Euro Dividenden STAUFER is an active equity fund that is fully invested at all times, pursuing an investment approach independent of any benchmark. The dividend-oriented fund aims to achieve substantial excess returns compared to the EURO STOXX 50 equity index. The rule-based stock selection process ascribes great importance to a robust dividend yield and a shareholder-friendly distribution policy. The concept incorporates an impressively sophisticated blend of valuation and dividend filters. 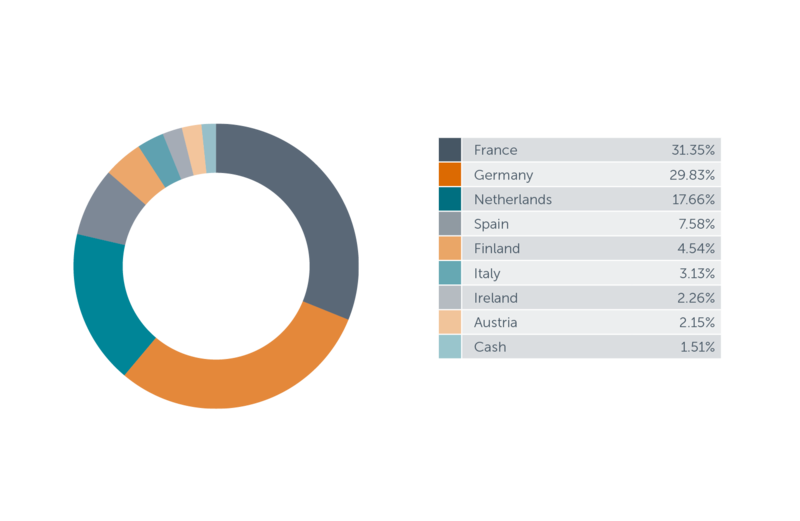 Building on a quantitative screening process, the fund invests in 40 to 60 of the most promising and robust dividend stocks in the eurozone. 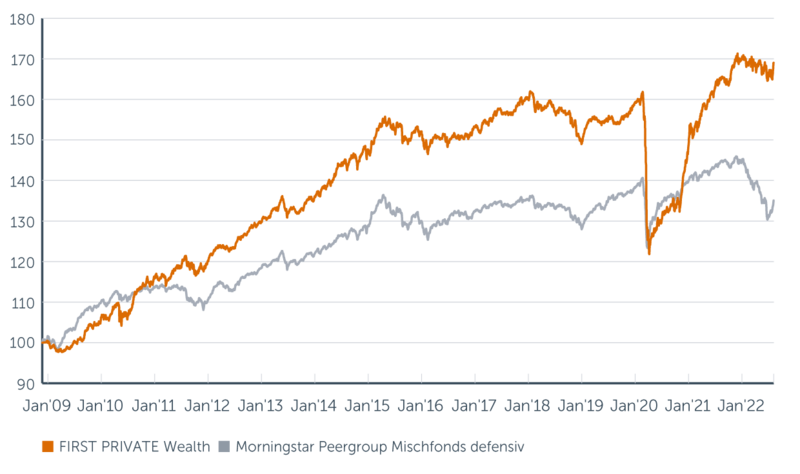 All in all, this multi-award winning fund offers substantial outperformance potential versus both its benchmark and passive dividend offerings. ** since 01.03.2006; previously 1,25% p.a. * Fund puplications are also availabe at www.fundinfo.com. 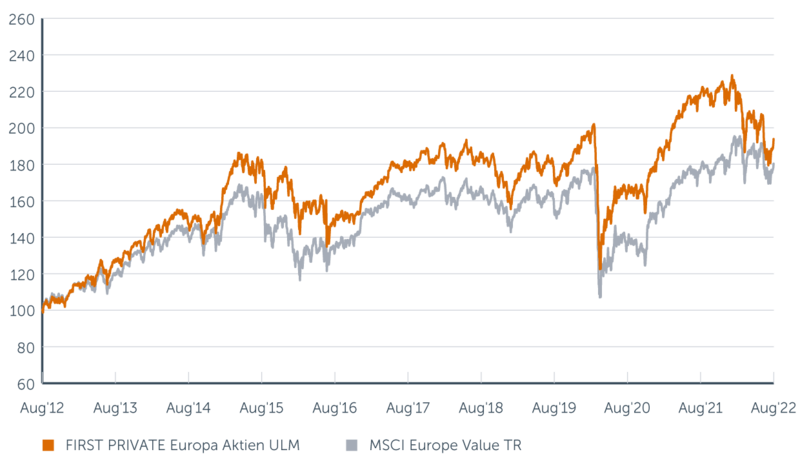 First Private Europa Aktien ULM is a European equity fund with a clear focus on value that actively targets excess returns versus the European equity market. The value-focused stockpicking approach follows a fundamental/quantitative selection process. Low stock market valuations relative to profits and solid earnings profiles alongside a stable financial base are the core components of this fund strategy. The best stocks are included in the portfolio optimisation process, which performs rigorous quality and risk controls. The outcome is a diversified stock portfolio. With its systematic, value-oriented investment process, First Private Europa Aktien ULM embodies the utmost in continuity, reliability and transparency at a time of short-lived and rapidly shifting trends. 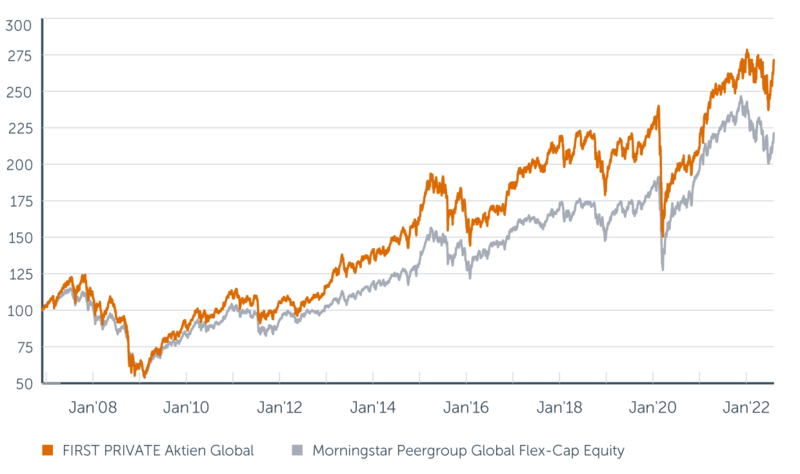 First Private Aktien Global is a globally diversified equity fund that is fully invested at all times. Its value-focused approach aims to achieve above-average returns compared to both value indices and the broader equity market over the long term. Alongside a strict liquidity filter, the multi-stage quantitative process incorporates fundamental and systematic stockpicking that builds on three sub-strategies. These independent approaches focus on high-value, inexpensive stocks, stable dividend payers and good momentum in factors like value, growth and quality. 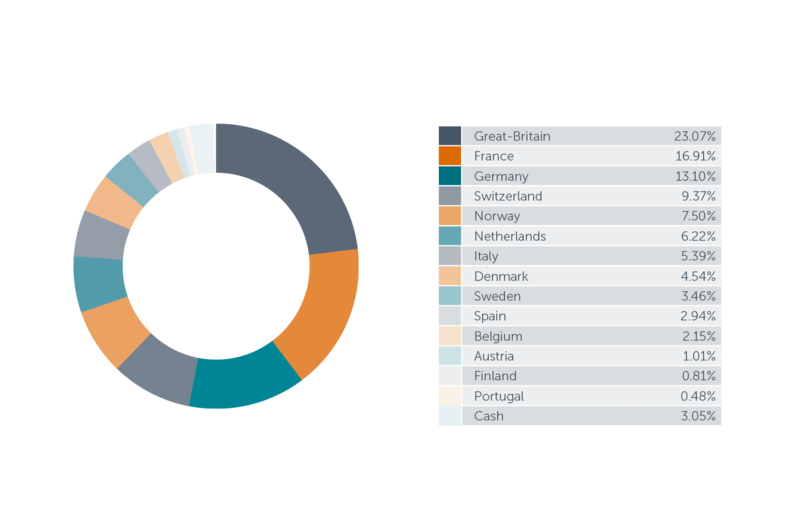 The fund invests in more than 50 countries. The most attractive 100 to 140 stocks are included in the portfolio following extensive risk analyses and subject to a balanced mix of the three sub-strategies. 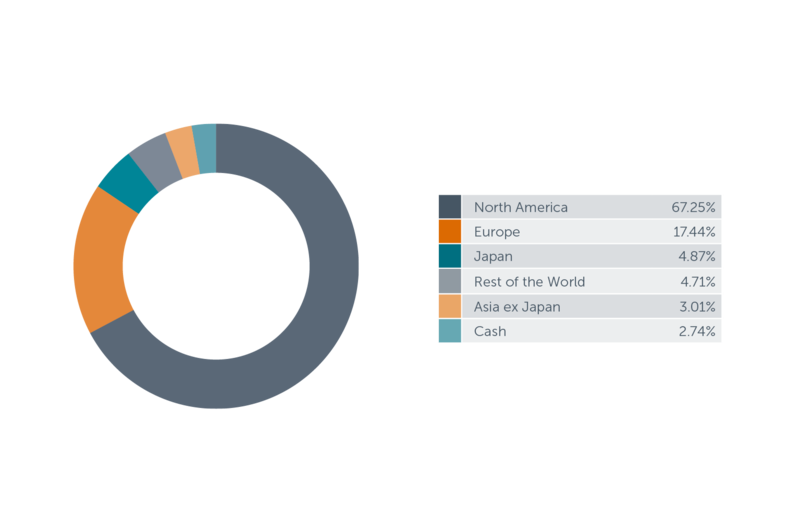 The fund concept offers impressively broad diversification at the style, sector and country levels as well as a flexible emerging markets allocation. ** unchanged since 26.05.2015, previously 1,50% p.a. With effect from 26.04.2019, unit redemptions are not suspended for any of the company’s funds.